TAKORADI, Ghana – More oil and gas has been discovered in the deep sea off Cape Three Points by Hess Corporation from the United States of America (USA). Hess Corporation, has successfully completed the drilling of seven oil wells which contain crude oil in commercial quantities. In an official communication to its investors on the New York Stock Exchange on February 28, 2013, Hess said it had “completed drilling of its seventh consecutive successful exploratory well on the Deepwater Tano/Cape Three Points block offshore Ghana”. Hess Corporation is a leading global independent energy company primarily engaged in the exploration and production of crude oil and natural gas and the marketing of refined petroleum products, natural gas and electricity. The seven drilled wells have been labeled as Paradise-1, Hickory North-1, Beech-1, Almond-1, Pecan-1, Cob-1 and Pecan North-1. 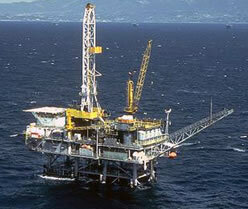 Paradise-1 was found to contain both oil and gas, while Hickory North-1 contains large quantities of gas. The company said the Pecan North-1 well, which was the last well to be drilled, was located approximately seven miles northeast of another well dubbed “Pecan-1 well”. The drilling of the wells spanned a period of three years. Following the successful drilling of its seventh well, the company has begun pre-development studies on the Deepwater/Tano Cape Three Points block where oil and gas has been discovered. The company said it now intended to “submit appraisal plans for the various discoveries to the Ghana government for approval on or before June 2, 2013”. The wells were drilled by the Stena Drillmax drill ship in a range of water depths between 5,623 and 8,245 feet. In an interview, the Minister of Energy and Petroleum, Mr Kofi Armah Buah, confirmed the discovery made by Hess Corporation and expressed the hope that more discoveries would be made in the future.